You'll be £10.00 closer to your next £10.00 credit when you purchase Wellington Against Soult. What's this? At the heart of David Buttery’s third book on the Peninsular War lies the comparison between two great commanders of enormous experience and reputation – Arthur Wellesley, later Duke of Wellington, and Jean de Dieu Soult. In Soult, Wellesley met one of his most formidable opponents and they confronted each other during one of the most remarkable, and neglected, of the Peninsular campaigns. 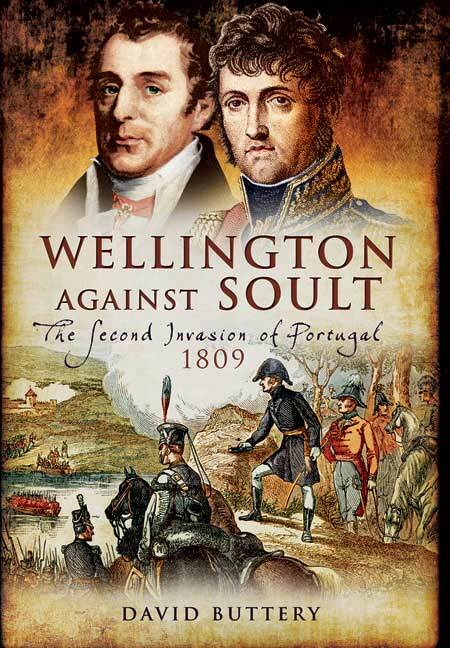 Soult’s invasion of Portugal is rarely studied in great depth and, likewise, the offensive Wellesley launched, which defeated and expelled the French, has also received scant coverage. As well as giving a fresh insight into the contrasting characters of the two generals, the narrative offers a gripping and detailed, reconstruction of the organization and experience of a military campaign 200 years ago. Overall this is an enjoyable read. Overall, this book was very interesting. A relatively little known story, with episodes of true heroism, clever strategies, tenacious resistance, and horrible atrocities. In Marshal Soult, Lieutenant General Wellesley faced arguably one of his most formidable opponents in the Iberian Peninsula. The author of this new book argues that the Marshal’s invasion of Portugal is rarely studied in any depth and, similarly, the offensive Wellesley launched, which defeated and expelled the French, has also received only scant coverage. The author follows the course of the campaign, drawing contrasts between the characters and styles of the opposing commanders. Some key episodes include Wellesley’s marked change of strategy as he took command of the allied troops in Portugal, from defence to attack, the liberation of Porto, Portugal’s second city from French occupation, and the dogged recovery of Soult’s army as it fought its way back to Spain. Further, Soult’s attempt to become king of Portugal and the ungracious reaction of Parliament where Wellesley was criticised for recklessness are among numerous other aspects of this previously under recorded episode of the Peninsular War. The book opens with an extensive chronology, followed by a preface. Also included are 30 monochrome plates, five maps, text notes, a bibliography and an index. A fascinating addition to the Napoleonic bookshelf and surely a ‘must’ for those particularly interest in the Peninsular War. Recommended. David Buttery has established a reputation as a leading historian of nineteenth-century British military history and the British Empire. He has made a particular study of the Napoleonic and Crimean Wars. He has worked in newspapers and in an oral history archive and has published extensively in many of the leading military history periodicals including the Victorian Military Society's journal, The Leicestershire Chronicle and Military Illustrated. His most recent books are Wellington Against Massena: The Third Invasion of Portugal 1810-1811 and Messenger of Death: Captain Nolan and the Charge of the Light Brigade.